Congress on Wednesday returns for its final session before the July 5 midterm elections, when the entire 500-member Chamber of Deputies is scheduled to be renewed. In the upcoming session, the National Action Party, or PAN, has promsed to focus on public security, the economy and credit card interest rates. The Institutional Revolutionary Party, or PRI, says it will fight for the "family economy" by freezing prices and introducing tax deductions. And the Democratic Revolution Party, or PRD, says it will propose an "emergency" law that would allow the federal government to spend money more easily, as well as push austerity measures like slashing lawmakers' salaries. But the final session before the midterm elections seldom produces much in terms of meaningful legislation, analysts say. Deputies in the lower house - none of whom can seek re-election - often take leave to seek other elected posts. "I expect to see a lot of grandstanding," ITAM political science professor Federico Estévez said. But Estévez did admit that the economic crisis might spur cooperation that usually doesn't exist in the lead up to federal elections. The PAN's congressional leaders have emphasized the importance of continuing with economic and security measures left unfinished during the last session. The PAN's coordinator in the Chamber of Deputies, Héctor Larios, said his lawmakers will push for overhauls to laws regarding acquisitions, public works and expropriations. The overhauls, he said, will allow the government to more quickly build roads, prisons, schools and hospitals called for in the infrastructure programs presented by President Felipe Calderón as a means of pulling the country out of crisis. "If we don't [spend] rapidly . then government action is going to be much less effective," Larios said while in Chiapas this week. Other PAN goals include passing reforms to the Attorney General's Office, or PGR, creating a new federal police corps, and passing a law that targets the finances of organized crime. 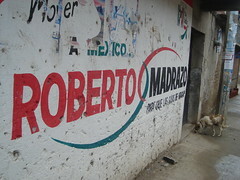 PAN Senate leader Gustavo Madero emphasized that his party would also target banking practices considered to be predatory, particularly those concerning credit cards. The PRI pitched various populist proposals on Tuesday, including the sanctioning of those who hang "narcomantas," or banners with threatening, drug-crime related messages. The party also stole a page from the books of several state legislatures, urging that those who sing "narcocorridos," or drug ballads, be punished. Other PRI proposals for improving public safety include a new federal kidnapping law, although a constitutional provision still must be approved by 16 state legislatures before Congress can begin work on that issue. PRI lawmakers also said Tuesday that they would push for a reduction in the price of diesel and electricity, make payments for medicine tax deductible, and encourage the federal government to present a labor reform package. The PRI lawmakers offered few details, but said that after achieving the approval of an energy reform package last year, labor reform would be passable before the session ends. PRD lawmakers have backed the idea of tackling labor reform. But they want it to target opacity in organizations like the heavily PRI oil workers' union and the SNTE teachers union, which has worked closely with Calderón. "If [reforms address] the democratization of union organizations, transparency, and the electoral process inside these organizations, we'll certainly go for it," PRD Sen. Tómas Torres said. The PRD will also present an alternative economic crisis plan.